Our oil discharge and spin-on filters fit into Busch RC Series oil sealed rotary vane vacuum pumps. Contact us for shipment from our stock. Our Service Department offers complete pump rebuilds, including loaner and rental pumps. 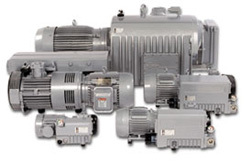 The Operations and Maintenance Manual for Rotary Vane Vacuum Pumps can be found here. Includes (4) Exhaust Filters, (4) O-Rings for Exhaust Filters, Spin-On Oil Filter, Gaskets for Exhaust Cover and Separator, O-Rings for Oil Fill and Drain Plugs. Includes Vanes, Bearings, Bearing Sleeves, & (4) Taper Pins. Includes (4) Shaft Seals, Cylinder Gasket, Oil Sump Side Cover Gasket, Service Cover Gasket, Oil Sump Cover Gasket, Oil Sight Glass Gasket, (4) Exhaust Valve Seat Plates, Multiple O-Rings, & Multiple Sealing Rings. Includes (8) Exhaust Filters, (8) O-Rings for Exhaust Filters, Spin-On Oil Filter, Gaskets for Exhaust Cover and Separator, O-Rings for Oil Fill and Drain Plugs. Includes Vanes, Bearings, Bearing Sleeves, & Taper Pins. Includes (4) Shaft Seals, Cylinder Gasket, Oil Sump Side Cover Gasket, Service Cover Gasket, Oil Sump Cover Gasket, Oil Sight Glass Gasket, (7) Exhaust Valve Seat Plates, (8) Rubber Boot Couplings, Multiple O-Rings, & Multiple Sealing Rings. Includes Send & Return Oil Lines and Plate Type Liquid To Liquid Heat Exchanger.